I love reading house design blogs and when I finally got my own home I thought it would be so much fun to have my own blog… I was wrong. Getting a blog is easy, maintaining it is another story. The blogs I like have these detailed, how-to projects and as much as love doing the projects I really don’t care to talk about them after they are finished. BUT, I don’t want to give up just yet so here is another attempt. This picture is of my new kitchen… pretty blah, but perfectly nice. I started by pulling up the old contact paper. And by ‘I’ I mean with my mom’s help and by ‘old’ I mean from the 1930s. It took a while. Then we cleaned it all up and then I decided to paint the inside of the cabinets the same color as the wall. 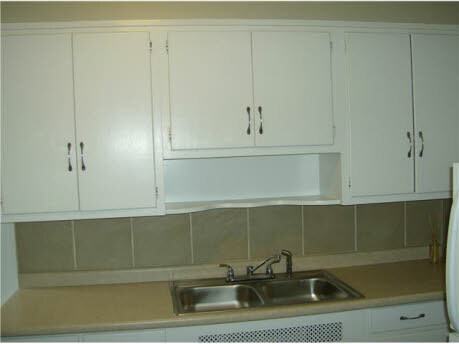 I don’t have a picture of the painted cabinets because I’m really bad at blogging.